My father liked sharp. He was a Gillette kind of man. He liked to look sharp, feel sharp and be sharp. I never saw him unshaven except very early in the morning before he’d had a chance to lather up. Beards? He was a child of the hard parts of the Depression and beards were for bums. My father favored the flat-top for himself and his sons. Butch Wax was a staple in our house and four males could go through a jar a week. He grudgingly accepted my 3-inch “Ivy League” cut once I went off to the university, but was never reconciled to the longer and longer hair that came later. My father was a sharp-dressed man. He liked the snap of a freshly laundered, starched and ironed white shirt. His suits were always cleaned and pressed and his shoes shined to a military gloss. I still have many of his gold and silver tie-tacks and cuff-links and although I seldom wear them, I do wear them. 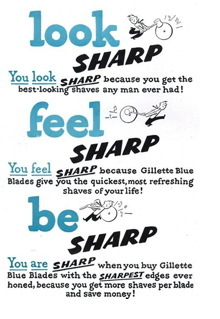 They make me feel sharp. My father was a man for whom honor was essential. Did my father sell as many cars as he could have? Probably not, but he raised three boys well and without want. My mother worked hard, day in and day out, as my mother and did, in the final analysis, a pretty good job of it. My father saved carefully and retired all debt as quickly as possible. When he died, a relatively young man after years of expensive medical treatments, my mother was still set up comfortably for life. My father despised debt and avoided credit. Educated by himself, he’d seen the worst of the depression and, during one hard winter in Pittsburgh in the 30s, had to hang out by the railroad tracks to pick up lumps of coal fallen from the trains in order to heat his home. What would my father think about a President who was a both a sharp-dressed man and was smoothly talking the country into buying trillions of dollars in deficits and entitlements? I like to think men like your father and mine are still out there. Dad was in sales, too. He hauled and delivered coal as a kid, landed on Normandy H9 and raised seven children - solid citizens, all. Wish he were here to reassure us that the ship will make it safely to shore. Quite simply, your father was a man of character. Our current leaders do not share that trait. They, instead, are "characters" who are in it for the power of the office. Search them for a hint of actual, not feigned modesty, or any impression that the world is not really all about them and how wonderful and smart they are. I suggest you will find none. My middle name is William, so in the family I was called Bill. My father called me Brylcream. My father had pet names for everybody. George Bush's penchant for giving people nicknames endeared him to me. As to the main thrust of this post, I think you have discerned something fundamental about Sarah Palin's appeal. There are a lot of factors involved. Physical appearance, wholesomeness, policies but now that you have written this post I think that her plain talking honesty is more important than realized. A very nice homage. It sounds a lot like the Senator. Butch wax crew, well-tailored suits, white shirts freshly starched and laundered by the maid. I shined his dress shoes to a mirror shine for a nickel, which he grudgingly paid. I too still have the tie clasps and cuff links I occasionally wear for the grand vibe. And your story reminds of what Harry Crews's father told him when he was a lad in the Depression: "The fastest way to see how sorry a man is is to dress him in a suit." That's when you separate the smooth guy from the man of character. My father used to like to say, "Never trust a man in patent leather shoes." His logic was that those shoes indicated someone who wanted shined shoes but didn't want to do the necessary work. He also used to say something about women with "painted eyebrows", but that's another story. My father was a man for whom honor was essential. Did my father sell as many cars as he could have? Probably not, but he raised three boys well and without want. My dad sold cars too, and he's a lot like this. I suspect his relentless exposure to the ethics of his fellow salesmen made him more like this. You have much to be thankful for in your father and what he believed in. And he would have much to be thankful for you in, and I believe especially in your political move to the right. business, and as it was failing he nearly worried himself into the grave for fear he would have to declare bankruptcy. Fortunately he hung on long enough to sell; then he worked for years to pay off the remaining debt. He went to war after he had 3 children (a travesty by a vindictive draft board chairman). He was widowed with young children. He worked until the day he went into the hospital for the last time. I never heard him complain. I often think of him and wish I had told him how much I respected his life. My dad told me about a car salesman he liked. They had my brother and I was on the way, and they didn't have much money. They needed a station wagon. This low key salesman showed them a Falcon wagon that was on the lot. It was plain-jane and was leftover from the prior model-year. He didn't show them more than they could afford, he showed them what they needed. They took it. I think they would have liked your dad. Your last line leaves me wondering...who's our repo-man? Kinda makes me shiver - at least til it occurs to me to lean on what the Bible says about the big Repo. How I miss my dad. Now I miss yours too. Just reminded me that I am long overdue for telling my dad how much I love him. You are always overdue for telling your parents you love them. Do it now before you lose the chance. Once they are gone you'll never get it back. My dad always said that credit was a great servant but a lousy master. I believe our "repo man" to be George Soros, a pitiless monster. My dad passed five years ago. I called my 87 year old mom last night, and told her my father was a very great man. She was very pleased, if taken aback. A man's character may be composed within a silent endurance, and manage more good the less he is seen. Not being seen is unimaginable for some. Your father sounds like so many of the depression-era men who fought and won World War II, and provided the work ethic that was responsible for the post-war prosperity. I salute them all -- your dad in particular -- and yet I wonder how it is that this generation produced such a feckless crop of children (Gerard and his readers excepted). My guess is they wanted to spare their children the privations they themselves endured, but the unintended result was the 1960s, and the ensuing decades of soft-headed leftism, hedonism, universal victimhood, and the end of the meritocracy that used to be America. Still, all that aside, your dad sounded like a heck of a guy. My 81 year old dad still has a flat top haircut and still usues Butch wax. He has had a flat top ever since I can remember. c.1970 I was the only kid in jr high that had a crew cut. My dad was convinced I would morph into a dope smoking hippie if I was allowed to grow my hair out to fit in with the other kids. I paid very dearly in hazing for that decision. Your father was a product of the times, much like my father. They had values, morals, were accountable for their actions. They did not need the "nanny state" to watch over them, nor did they rely on the government for their survival. My father paid for everything in cash and never had a credit card. The only purchase he ever financed was a home, and I recall he paid it off in record time. They were indeed the Greatest Generation. Also, my father was a veteran who joined the British Army when he was 15 years old. He fought the Germans in Africa and later was in Palestine under the British mandate. After the British, left, he joined the Israeli Army. He never ever spoke of any of the experiences he went through and never used a shrink or therapy to face life's challenges. This was before the label of Post Traumatic Stress was even thought of. He never had a sense of entitlement and went through life as an example that people need to do what they need to do to survive. My father died in 1981. I was too young to appreciate him, or the qualities he shared with your father.Every year that passes I regret my loss of him more sharply. I do find my grief somewhat assuaged by caring for my own mother as he would have. I'm grateful the lessons he taught - about independence, responsibility, the value of work and the importance of honesty - took root in my own life. As our society changes, I see ever more clearly how right he was. To the extent we have fathers to honor, we will behave as honorable men. Our nation cries in its sleep for action ... integral, honorable, and muscular action ... from the type of men who've posted their thoughts here. I bid you all Merry Christmas and a productive New Year. We have unusual work to do, and lots of it. I pray, as our honorable fathers surely did, that our efforts further the freedom of men and the glory of God. Barack Hussein Obama, true. Also, I immediately thought of Tony Blair. As far as I know, Bush left office not in bed for profit with the AGW crowd or the Middle East peacemakers as kingmakers jetseters. Blair, on the other hand, has managed just this, on top of his growing real estate empire. My father had a hole in his soul. He was abandoned at birth in Covington, Kentucky, then the Tijuana of Cincinnati. He drank a lot most of his adult life and died young of industrial related cancer. Despite all that he went to North Africa and Europe to fight Hitler and went to work in a stinking chemical factory in western New York every day hangover or not. I wish I would have had more time to know him better. Happy Father's Day to all. The greatness of American lay in men like your father. Thanks for sharing this. I wish we had more men in this country like your father. Men like that are the backbone of civilization. I'm glad you had such an awesome father. What a great tribute; as a friend shouted to me as my father and I walked away from his house after a fine lunch - "You lucked out; you got a good one!" You had an awesome dad. A tribute. My "dad" by default was my Grampa. He had the same characteristics you mentioned of your dad. I'm sure as ! @#$ glad he stepped up and put a roof over my head, and saw that I never did without, and taught me what it meant to be a man. A minister, he built 5 churches across the south, raised 5 kids (beside me) and worked a full time job. Gave me something to pass on to my kids. The real dad you ask? Mine skipped, remarried, raised three other kids, but never paid a days child support to my mom. What a man... He would have voted for Barack O. So often when you tell us your stories, I think how much alike we seem. It could be the age, I think we are the same or close, then I thought maybe it was Berkeley, not my school, but both my Mother's and my Uncle's and my Grandparents lived within walking distance, but now it has to be Pittsburgh. My father, born in 1908, was a Pittsburgh native and except for his time away at college, lived there until after his marriage in 1938. And like your Dad, he insisted on looking sharp. As a big man, over 6'4" and football playing weight of 280, he was always looking for sales on clothes and shoes in his sizes. After my parents' marriage, my Dad, a Civil Engineer, became the project manager for the new flood wall project 70 miles to the East in Johnstown. All our major shopping, however, was done in Pittsburgh, all our family holidays, since my Mother's family was also there, even though she had grown up in Piedmont, CA. When Kaufmans or Hornes was having a sale on big man's suits or shoes in my Dad's size 13s, he'd buy 2 or 3, dress shirts were bought by the dozen. He used to tell me, make sure the man you marry will buy his own clothes. In my Mother's journal for the year she met my Dad, she described him after their first meeting as rather intimidating by size, but very witty and funny, and spiffy in his dress, respectful in demeanor. My Dad expected us to dress for dinner every night even if dinner was nothing but mac and cheese. He wore his hair neatly cut and with a sharp part. (I used to love to go to the barber shop with him.) The only time I saw him wear casual clothes was on Saturdays and on vacation. And he was just as fussy about my appearance. Anyway, all the men in my child's world in Pittsburgh sound very much like your Dad, except for one minor detail, they were all Republicans. My Grandfather was also a Civil Engineer and the head of the Pa Dept of Hwys for many years. When I was very little, he made me memorize all the bridges in Pittsburgh because most of them were built under his watch. Even though that task was boring for me at such a young age, my father would be very strict about being respectful of the accomplishments of others. He, more than my Mother, insisted on things like written thank you notes for gifts and what he called proper deportment for a young lady. I can still here him saying, don't slouch, stand tall and stand proud and his favorite, for Pete's sake quit scuffing your feet. Well done. Times will be hard again once the milk and honey is gone. Folks just naturally like to be bullshat, until they figure out that is what's happening. I've always been partial to Kipling's Gods of the Copybook Headings. Your father was my kinda fellow. I'm a Democrat, too, but my liberal pals swear I'm a far right Republican. They've forgotten basic American principles. Will we see the likes of men like your father again? Remember: Be the change you want to see in the world. "Butch Wax was a staple in our house ... "
On a day filled with nostalgia - well, I forgot Butch wax completely. Now I can smell it, and sense its feel as I scooped it out. Later, when I grew hair in the style of Elvis, there was a product called "Wave Set," I think. You dipped your comb into the bottle, and it set your hair like it was plastic. If I ran out I used dad's Wildroot Cream Oil. Happy Father's Day to you, Vanderleun! I second Jewel's comment above! Happy Father's Day Vanderleun! Fathers are funny creatures, Gerard. Mine's been gone for 16 years now. Some days, I miss him so much I want to cry. Other days, I'm so relieved that that pig-headed old so-and-so in gone. Maybe the fact that I feel that way about him says more about me that it does about the Old Man. Mine's been gone for 16 years now. This past Tuesday would have been his 86th birthday. I don't think obama is a slick talker at all, far from it. I think he's an habitual liar and easily believed by silly fools. As far as talking the country into buying debt, nothing of sort happened. The politicians in group decided to do something and there is no mechanism to stop them so they went ahead. Don't pin all of this on obama alone. Despicable as he may be, he is only a partner in the crimes, with lot's of help. Once more for the slow learners, you are not responsible for debts others incur. round the shared belief that they can see. how to be the best you can. This is a classic piece. Thank you, Gerard. My father was a longshoreman before WWII. After the war, he attended the American Academy of Art and became a fine artist, an excellent portrait painter. But he never strayed far from his roots. He'd grown up in the Depression, and he had a deep fondness for the Stoic philosophers. One day, when I told him I didn't want to go to school that morning because I didn't feel so good. He told me, "Dear, the world is run by people who don't feel so good," and made me get out of bed anyway. Okay, another: One morning, I saw little black things floating in the milk of my Cheerios and pushed the bowl away. Father said, "Eat it anyway. The world is full of little black things." According to my Dad, the world was full of a lot of minor irritations that you had to shoulder your way through, and I'm grateful to him for these homely lessons.